Ever since I bought two packages of pork chops on sale at Price Chopper, I have been meaning to make this recipe (ok, I make it sound like I bought them forever ago, but it was really just 2ish weeks ago). I finally made it last night and it turned out quite well. I have been slacking on meal-planning this week (ie. I haven’t been grocery shopping since I stocked up on meat products two weeks ago), and so I’ve been trying to find recipes involving ingredients we already have at home (that’s not bad, when you’re on a strict budget, thanks to Mr. Dave Ramsey). The only thing I had to buy for this recipe was cocktail sauce, and I have to admit was a little worried. I’m not a fan of cocktail sauce, so why on earth would I make a meal containing it? I figured that the flavours of the other ingredients would block it a bit, and I was right. This is titled “Mistakenly Zesty Pork Chops” by the person that submitted it to allrecipes.com, however I didn’t really notice a “zest.” I think the ketchup cancelled out a zest, and I didn’t even use that much ketchup–probably half of what the recipe calls for, because I ran out. It was also a bit on the sweet side–there was brown sugar in the first marinade as well as the second, next time I would perhaps cut a bit out. I also tweaked it a bit (aka omitted the water from the first marinade and didn’t boil it first). That all being said, I still enjoyed it, and my husband gobbled up one and a half chops. 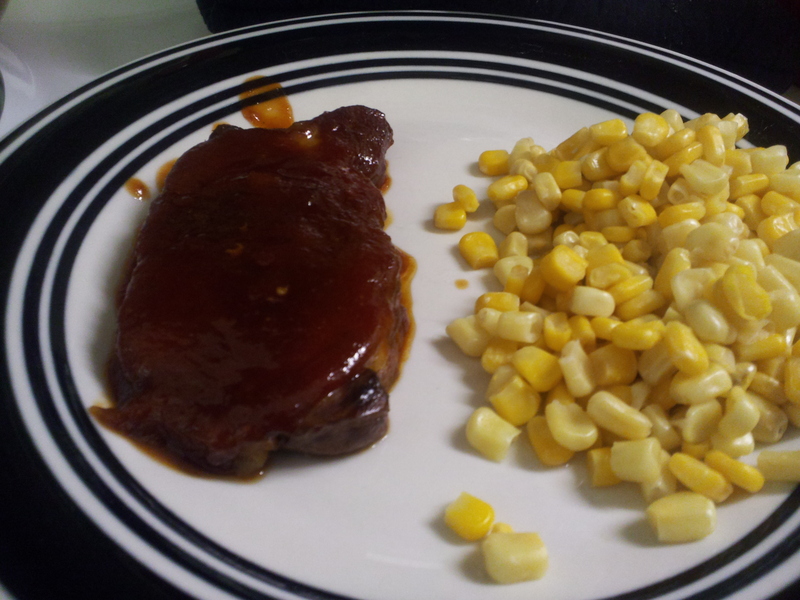 I paired it with corn – healthy, I know!